…I’ve decided to do a post about…gowns! See the connection? Don’t worry, you can’t be in on the joke every time. I recently attended the first ever Bloggerini Event at Lair NYC, where style expert Katlean de Monchy (she’s a regular on NBC’s TODAY Show, E! News, CNN and Inside Edition) showed us mere mortals how to look like red carpet divas on a mere mortal budget. The dresses were all by Camille La Vie, doyenne of wedding dresses, prom dresses, and dresses of general awesome gorgeousness, you know, for that revenge date with that guy who dumped you in high school (oops, did I say that out loud?) I was truly baffled by the details and materials and the fact that just about all of them were under $500. Mere mortals unite! There was also a display of Katlean’s newest jewelry line, the de Monchy Collection, perfect for pairing with these stellar dresses, or with jeans and a tee to pump the volume. Case in point, here I am in a decidedly non-shimmering outfit, and if I may say so myself, that green has perked things up. Speaking of perking things up…the event was sponsored by, among others, Voli vodka, a low-calorie option for those who get all their calories from booze (ahem). I had the Bloggertini, a lemon-y, raspberry blend of deliciousness, and it did not taste like I was on any kind of booze diet. Liquid calorie consumers unite! So, I’m inventing a new expression: Revenge is a dish best served on the rocks and sparkly. So I recently went out of town and had the great fortune to come back to NYC in the middle of the morning on one of the warmest, clearest days in forever. As I was flying over the city, I just felt this overwhelming sense of happiness that I live here and get to be on the ground, amid the frenetic pace and exoticism. I’ve been very lucky in life, and had some truly fabulous experiences, so I’m pretty much thrilled on a daily basis to add living in New York to that. So to everyone who loves this incredible city, this one is for you. So last Thursday I attended the Crest 3D White Party, as I had the fortune to be one of 50 people to RSVP first to Daily Candy‘s invite. I got my white strips in the mail, put them on 2 hours before the event and when I got there, there were all kinds of treats to help me show off my new smile: a brushing station for proper post-white strip application care, then hair and make-up to get me ready for my close-up, and last but by no mean least, champagne. 🙂 Oh, and how could I forget, an uploading station for immediate transferral of the glam shots to my facebook page! The pic above is a tiny version of my close-up (I did everything I could to get a bigger version), taken from facebook, so click on the pic or the link below to see the bigger version. Later, at Drom NYC. Check out that smile, you can see it from space! After all is said and done, I have to say I really saw a difference in the before and after with the white strips. I had been meaning to try some kind of at-home kit, and I think this may just be the ticket. Thanks to the Crest 3D White crew for a fun time. Going to spread the word on this one. Light and dark, soft and hard, thesis and antithesis…having contrasts can be a great thing. They bring dimension and diversity, adding that Je ne sais quoi where it was previously non-existent. Michael Angel’s Spring 2011 collection was full of them: hidden vs revealed, inspired by a recent trip to Rome, bursting prints vs matte, transparent latex, buttoned-up collars vs. skirts with daring slits. Throughout it all, the designer kept his trademark prints yet somehow managed to present a simple, minimalist collection that was at times, appropriately austere and lush. If the models on Buckler’s Spring runway looked like fresh-faced Eastern European athletes, that look was intentional. Designer Andrew Buckler, whose self-proclaimed design concept is “English bloke meets New York,” said he was inspired by Bauhaus, as well as the 1936 Olympics. “The guys have sort of just come in off the running field,” the designer shared with FPD in a quick post-show interview. There was a weathered elegance to the pieces, with a splash of sportiness and a pinch of rock and roll. I’d like to think that if Kafka was around, he might pick up a Buckler piece or two on the way to the library, or the gym. 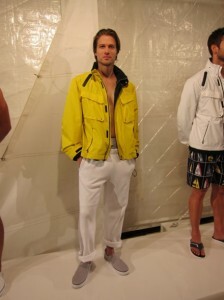 For Nautica, Spring 2011 is all about the water , the people and the places of the American Southern Coast: easy, charming, vibrant, authentic. A great showing of casual, yet put-together menswear echoed the sentiments of spring 2011: variations of khaki with a burst of color here and there is the way to go. “A mix of beauty and distortion, the collection is inspired by the intoxication of accepting madness.” This is the opening statement on Sally LaPointe’s Spring 2011 run-of-show. What followed was beautiful and distorted alright, with exaggerated shoulders and hips, and rose-embellished moon boots with billowing, amorphous dresses. It was foreign and bright, with lots of shimmering silver and patches of black, much like what you imagine a trip to the moon might be. Eco-friendly fashionistas out there, prepare to be blown away by Luis Valenzuela’s Spring 2011 collection. The artist/designer was inspired by, of all people, his grandfather, to create a women’s collection made from existing materials: a lamp shade, men’s trousers, an old chandelier. The result was a whole new take on “masculine” women’s wear. Valenzuela still managed to evoke Victorian drama even when you could see the waistband and belt loops of a pair of men’s pants as the back of a model’s dress.